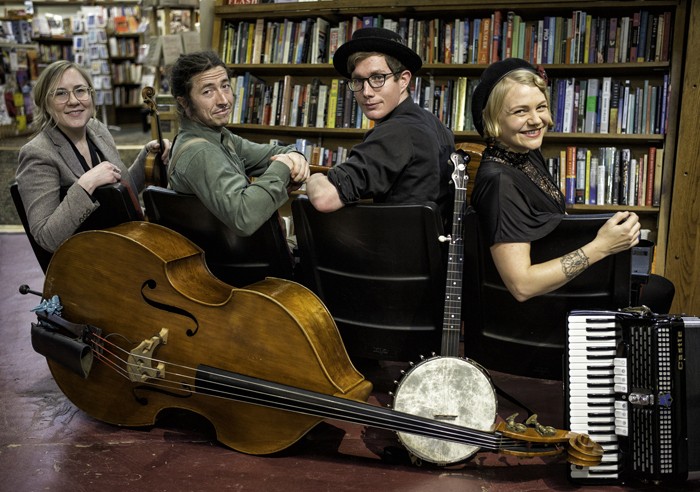 THE RESONANT ROGUES: Asheville, North Carolina’s genre hopping troubadours, The Resonant Rogues, have been winning over audiences worldwide with their signature blend of string band music since 2013. Influenced by traditions from Appalachia, New Orleans, France, the Balkans, and beyond, the original songs speak to the heart with poetic lyrics, and appeal to the ears with stellar musicianship and arrangement. The Rogues have a big year of album release tours in support of their new album, Autumn of the World, including the UK for the month of July. The UK tour will feature old-time fiddle champion Kristen Harris and Daniel Iannucci on upright bass rounding out the core band of Keith J. Smith on guitar and vocals, and Sparrow on accordion, banjo, and vocals.